First off is the Battlefield [and perhaps most other team-based shooter] staple mode - Conquest. This mode plays much the same as previous games. Each team has a base, and between both are five command posts which are contested over. Kills knock off tickets from the opposing faction, as does owning the most command posts. The winning team is the one which can reduce the opposing team's tickets to zero. However, owing to the new theme, this mode plays a little differently. Vehicles do not have on board weapons [except the helicopters, but not for the pilot]. In that respect, they are just transport. But any passengers in the vehicle can still use their weapons. Thus, having a fully stocked vehicle ensures better success. Since the vehicles' power have been considerably lowered, factions are now set up to not have uber powerful RPG's and the such. They can still be powerful, a number of weapons can certainly overcome a vehicle if you keep with it enough, but there won't be any one hit kills on vehicles or infantry from vehicles. Except getting run over, of course. Bikes are fast, and are light, and as such come with a jump bonus in points. Points are very much the same as previous Battlefield games - in that earning enough of them in a single class or vehicle, even weapons, will net you service stars - but added to the mix are coins and money. Coins are earned for achieving a certain number of points, kills or bonuses. As such, they sort of act like ribbons. But collect enough of them, and you earn a bounty. These act as nothing but trophies, but look good when others see your profile. Then we have money, which is used to buy weapons and gadgets. While not much more than a simple change, it affects how you approch things. For one, you no longer need to use a weapon in order to earn points and unlock more of that particular weapon. But you do need to meet other critera. These are either getting kills with the opposing faction, or completing assignments or missions. There is also a loadout for each class - one for the police, and one for the criminals. There are a number of loadouts this time, but only one unlocked from the start. The others are unlocked through either points or Battlepacks, which make a return. Now then, the two new modes. First off is Heist. The criminals break into a bank and take two bags of money to select drop off points, while the police try to stop them. The mode itself takes a bit to get around, in terms of learning the best way to tackle the objective, but once you do it is very fun to play. Teamwork is required of both teams. The criminals have to protect the team member who has the bag of money, as they will be main target for the police. The police, meanwhile, can set up traps near the drop off points to catch the criminals off guard. Whether that be an ambush or a well placed trip mine, the criminals have a tough job to get to the drop off points - providing the police set their traps well. The more interesting of the two though, is Hotwire. This is a special conquest mode where the special vehicles dotted around the map are the command posts. To capture one, you need to be driving at speed. But the opposing faction is working to the same objective, and both teams can employ the same tactics from conquest here. A fully stocked vehicle, especially a special one, can protect or destroy. Crashing into someone dips their vehicle's damage slightly, and if you can trap them, it becomes easier to destroy them. Once a special car is destroyed, it will respawn. The key is to have your team be in command of as many special vehicles as possible. Just like with conquest, whoever owns the most command points will knock tickets off the opposing team. But unlike conquest, infantry kills have no effect. Only the special vehicles do. Whether that be driving them or destroying them. Of all the modes, this one was the most action packed. And as you'll see in my gameplay video, especially fun. Dotted around maps are more powerful weapons. These are where your RPG's and uber weapons come in. If you pick one up, you have to keep it. If you swap out to another weapon, you will drop the pick-up weapon. These are more tactical advantages than anything, and the specific placement within buildings show this. If used carelessly, they can be more damaging to your efforts than anything. You need to be in the right place to use one of the more powerful ones, such as a stinger, but find a regular gun [well, a powered up gun, anyway] and you can turn the tide of battle - so long as you don't get caught in crossfire. The maps. Dust Bowl is a more open map. What little built up area it does have offer little protection from the war. Set in a desert, it has a very wild west feel, but in a modern sort of way. The gas station is a nice touch. Downtown is a city. Very tall buildings, straight roads, a multi-storey car park, and a little park area. Both Downtown and Dust Bowl can be played on both Hotwire and Conquest. Bank Job is a Heist only map. The bank takes up most of the map, with a road running the whole way round it. Again, there is a multi-storey car park, and this is where one of the drop off points are. On all the maps, there are numerous places for snipers to set up. There is room for multi-level warfare. And there are numerous places to hide. Battlefield Hardline feels more arcade-like than the main series, whether that be from the slightly boosted speed, the set-up of the modes and maps, or the focus on infantry rather than the full range of military knowledge. 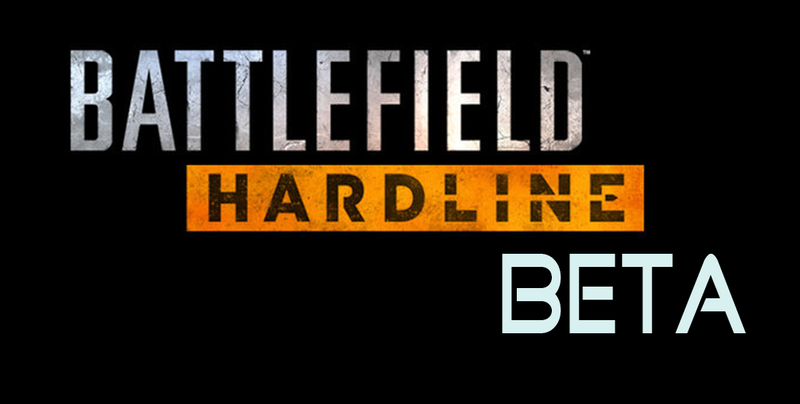 In sorts, Hardline is in between Battlefield and Call of Duty. In other words, the speed and quick action of Call of Duty is mixed with the tactics and depth of Battlefield. Some might say otherwise, but that's how I'm calling it. One thing I do note though, is that the levelling system seems to be quicker. Whether that is just for the beta, I have no idea, but I've been playing only a few hours, and am almost up to the level I am on with Battlefield 4 . I'm sure the levelling won't be so heavy-handed in the final game, but it just struck me how fast I was going through levels. Maybe it's the modes themselves, and the points you can earn from them being greater. And now, for the video itself. It is a highlight reel, showcasing elements from the beta. It has both factions, all three maps, and all three modes within it. All weapons used are the default set. I did not change anything. Enjoy. Battlefield Hardline Beta Highlight Reel.